China's second lunar probe, Chang'e-2, will be launched in October 2010, a top space scientist said Thursday. Ye Peijian, chief designer of the nation's first moon probe, told the third International Conference on Space Information Technology in Beijing yesterday that the country's lunar lander and rover, Chang'e-3, is also well on the way toward liftoff -- the project is in the prototype stage and its launch is set for before 2013. Ye said the second lunar orbiter will carry different payloads and orbit the moon in a different way. "It will orbit 100 km closer to the moon and be equipped with better facilities. We expect to acquire more scientific data about the moon with increased accuracy," he told China Daily. Though Chang'e-2 was at one time the backup to Chang'e-1, it has gone through technical upgrades for its new mission. Payloads on board have been improved, and the vehicle now boasts a charge-coupled device (CCD) camera on board, which has a much higher resolution than the camera on China's first lunar probe. Ouyang Ziyuan, chief scientist with China's lunar exploration team, said on Wednesday during an interview with people.com.cn that systems on Chang'e-2 are undergoing "match-up and drills" and everything has gone well. Tests will also be carried out during Chang'e-2's mission to prepare for the lunar lander and rover, Ye said. Chang'e-3, China's first lunar lander and rover, is scheduled to be launched from a Long March 3B launch vehicle from the Xichang satellite launch center before 2013, he said. At present, work on Chang'e-3 has gone beyond the planning stage and the machinery is now in the prototype stage. "Completion of the planning stage means there is no technical barrier for us," he said. The landing site on the moon for Chang'e-3 has also been chosen. Ye said it will be in the Sinus Iridium (Bay of Rainbows). The scientific objectives of the project include investigating the lunar landscape and exploring the geological structure of the moon. The mission will also help China study the material composition of the moon and search for usable resources. Scientists also hope the Chang'e-3 project will let them study the internal structure of the moon and, ultimately, they want to build an observatory on the surface. Earlier reports by Xinhua News Agency said the lunar rover will leave Chang'e-3 and work on the moon's surface for three months. Scientists have decided to use an isotope technique generator to produce energy for the rover to enable it to cope with the lunar nights, where temperatures can drop to 200 C below zero. 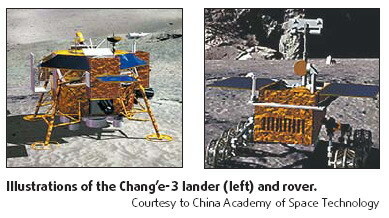 Chang'e-2 and Chang'e-3 are part of the second phase of China's lunar exploration program. The third phase will see China send a spacecraft to the moon to collect samples and return. That project is slated for before 2017. China launched its lunar mission in 2007 when it successfully put an unmanned probe, Chang'e-1, into lunar orbit. The spacecraft transmitted pictures of the moon's surface in January 2008. Chang'e-1 ended its 16-month mission on March 1 when it impacted the moon's surface. The successful conclusion brought the first phase of the nation's three-stage lunar mission to an end. China became the third nation - after the US and Russia - to put people into space when Yang Liwei went into orbit aboard the spaceship Shenzhou-V on Oct 15, 2003. Another three astronauts traveled to space in Shenzhou-VII and carried out the country's first space walk in September 2008.